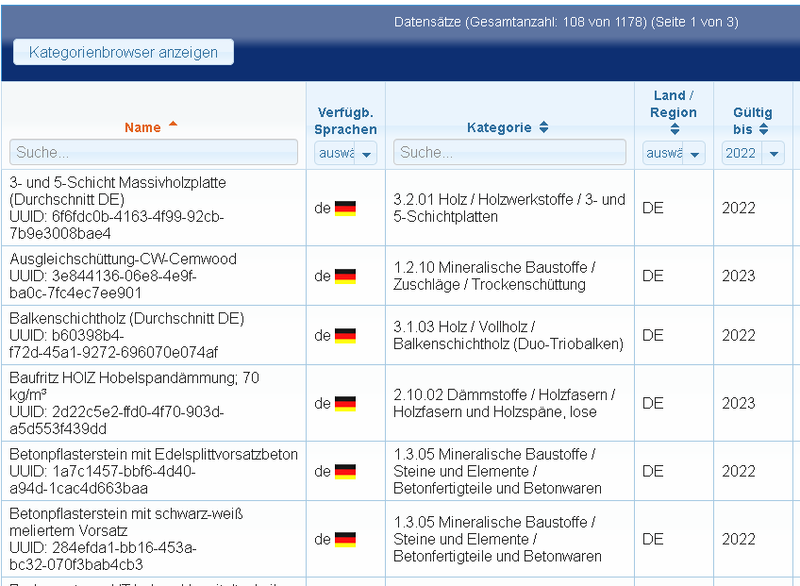 Year-Round Entry of EPD Data to ÖKOBAUDAT Now Possible | Institut Bauen und Umwelt e.V. With ÖKOBAUDAT (www.oekobaudat.de), the German Federal Ministry of the Interior, Building and Community (BMI) has made available a standardised database for the life cycle assessments of buildings. It serves as a source of binding information for both the Assessment System for Sustainable Building (Bewertungssystem Nachhaltiges Bauen für Bundesgebäude, BNB) and the German Sustainable Building Council’s certification system (Deutschen Gesellschaft für Nachhaltiges Bauen, DGNB). The data sets contained in it are differentiated into generic data and company/organisation-specific data that is provided in the form of EPDs. The EPD data is, to a major extent, provided by the Institut Bauen und Umwelt e.V. (IBU), operator of the German EPD programme for building products. Although it has not been possible up until now to enter new data outside of the regular ÖKOBAUDAT update cycles, beginning immediately, data sets may be transferred at any time to the ÖKOBAUDAT using the IBU’s EPD Online Tool (www.epd-online.com). After approval by BBSR these EPD data sets will then be directly accessible in the building life cycle assessment software tools that have been incorporated into the database, e.g. the eLCA tool provided by the German Federal Institute for Research on Building, Urban Affairs and Spatial Development (BBSR). Declaration holders interested in having their data sets submitted to ÖKOBAUDAT are requested to use the IBU EPD Online Tool to complete the required digitisation parameters for their EPDs. Instructions as to how to do this are provided in our Webinar “Transmission of EPD Data Records into ÖKOBAUDAT”. If you have any further questions about this process, please contact Nora Pankow at the IBU home office.